Celebration Florals: Kelsey and Joe marry along the Willamette River! 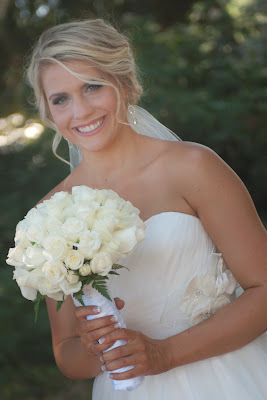 Our beautiful bride Kelsey! We were so honored to design the flowers for Kelsey and Joe's summer wedding. Peggy has known Joe's parents for more than 35 years, so this we certainly special for her. The wedding took place at a private residence on the Willamette River. We are looking forward to receiving the professional photos from At Play Photography! Classic white rose bouquet. We used three different sizes of white roses to achieve this look. Stunning and beautiful. Peach, white, and navy were the colors Kelsey and Joe selected. Loved the clean lines of the peach and white roses Kelsey chose for her maids. Bouquets were wrapped with a lighter peach satin. Yummy! Staying cool in the shade in the late afternoon heat. Who would have thought that the July 4th weekend in Oregon would be HOT! A special moment as Kelsey's father escorted a radiant bride toward her groom. A great use for the carnation orbs that lined the aisle. We transfered these to cylinder vases for the head table. Loved the custom designed table runners!